BANFF, ALBERTA, Canada – Snowy peaks, sunny slopes, waterfalls, lakes and vast seas of wildflowers — get back to nature with our Heli hiking tour in Banff, Alberta Canada. With more than five different areas to hike, let us tailor your trip to you. Whether you prefer a leisurely hike, or want something more demanding, our fun and knowledgeable tour guides will be with you every step of the way. A gourmet lunch will be provided. A family favorite, our Heli-Horseback tours showcase the best of Banff, in the air and on the ground. Never ridden before? Don’t fret — we have a range of friendly horses to accommodate all levels. A BBQ picnic completes the cowboy experience and makes this one of the best Banff sightseeing tours. Banff receives an average of 15 cm (6 inches) of rain annually. 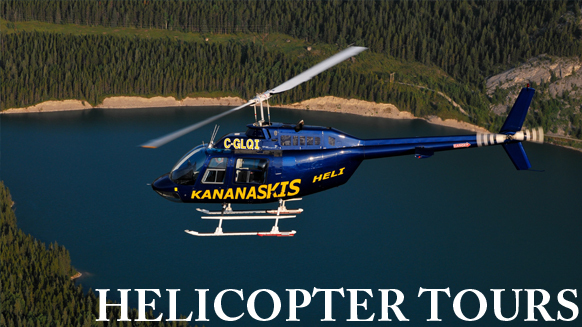 Compared to other areas of the Rockies where there is double that amount, we are well situated for our helicopter tours and activities.